I started the art tour last night at Space Gallery. A few pinpoint-sized rain drops were intermittingly hitting the windshield when I arrived at the gallery. By the time I left Pirate Contemporary Art two hours later it was a full-fledged snowstorm. 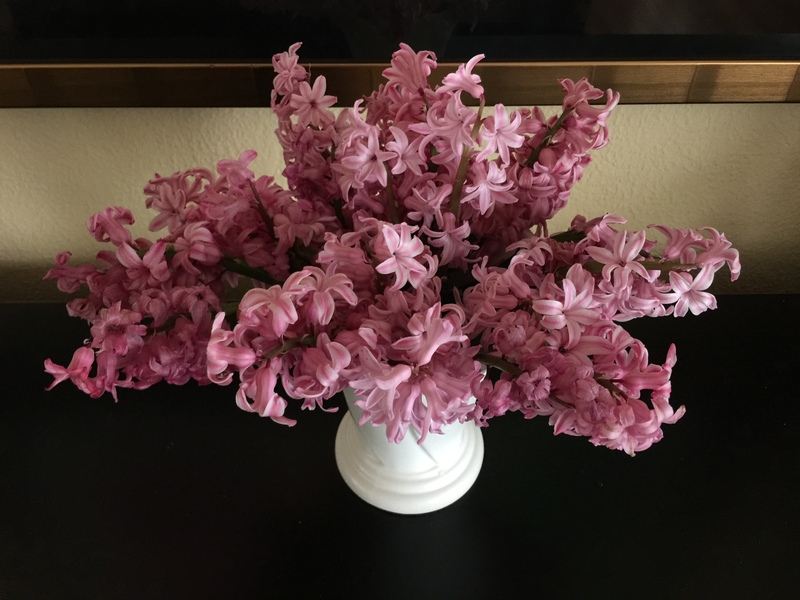 When I got home, I cut some hyacinths from the garden that survived the bomb cyclone. I felt I needed to rescue them from a second round of snow. It’s a cool spring morning. The sun has managed to burn off the cloud cover. I’m back in bed after getting up early. I enjoyed a breakfast of avocado toast and a banana while catching up on a few blogs. It’s the kind of morning that makes me miss cuddling in bed with a guy on a weekend morning. I need to hit the shower and take Morgan to the grocery store but I keep stalling. The bed feels incredibly comfortable in the cool bedroom. The cat is sunning himself in front of the French doors on bedroom floor. His other half in being warmed by the in-floor heat. It’s no shave Sunday so I only need to shower, brush me teeth and dress. Jacqueline cut off nearly all my hair on Friday so I don’t have to spend time on it. I’m practically bald and barely need product. Morgan and his partner returned from Italy last Wednesday. Morgan fell ill the last part of the trip. He was hospitalized on Thursday with pneumonia. He was discharged on Friday afternoon. His partner fled to the bathhouse after Morgan returned home and has yet to resurface. I’m taking Morgan to the market. That’s what friends do when a friend is married to man who puts his sexual desires before his husband’s recuperation. Perhaps being single isn’t as bad as I thought. I met another married man. I’ll post about it in a few days. In the meantime, enjoy this whimsical sculpture by Gayla Lemke currently on view at Edge Gallery in Denver. I find this image simultaneously funny and disturbing. I hope you’re having a great weekend. I’m off to brunch with my neighbors. I hope Andy Cohen sees this. I spent a good portion of Friday evening hanging out with Mai Wyn and Stephanie at Mai Wyn’s Gallery. I had a great time talking about art with these wonderful women. Here are a few selections from the group show currently on display at Mai Wyn Fine Art. Katharine McGuinness, Black Poppies, litho ink and spray paint on panel, 48 x 48, $3,600. Fawn Atencio, Constructed Territories #3, Graphite, gouache, and litho ink on panel, 12 x 12, $350. 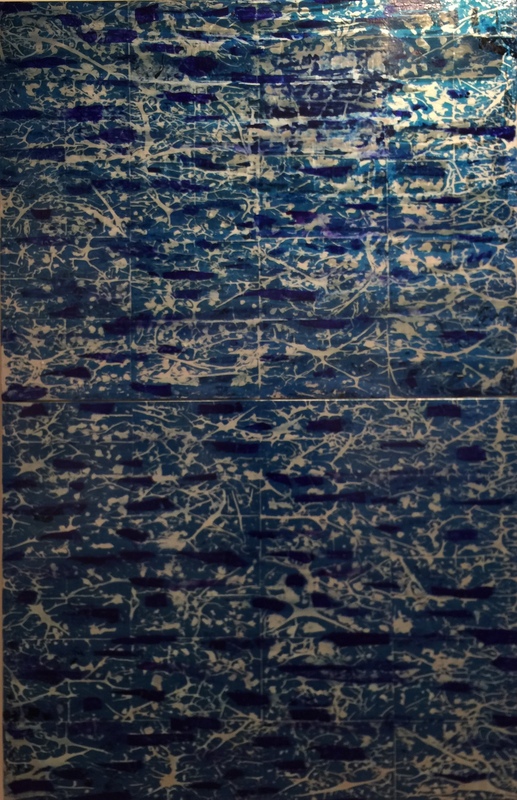 Sharon Strasburg, Meandering, laser cut monotypes on panel, 12 x 12, $1,000. Mai Wyn Schantz, Witness, oil on stainless steel, 48 x 42, $6,500. I stopped by Pirate Contemporary Art for the opening of their group show. Here are a few of my favorites. Lisa Fernandez, You Can’t Go Home Again, oil on Canvas, $1,600. Louis Recchia, Wounded Angel, oil on canvas, $1,200. Tsogo Mijig, Inception, acrylic on canvas, $1,850.